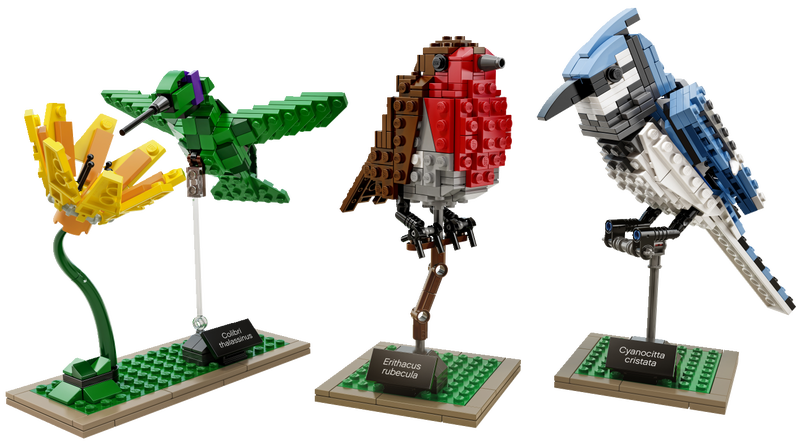 On November 7th, Lego announced that they would be producing a set based on Tom Poulsom's Bird project submission to Lego Ideas. Lego did an interview with the creator of Birds (21301) where we get a peek at the set and box art. Because the set uses only existing elements in colors that were already available we get a really quick turnaround on this one. It looks like from approval to sale will be right about 8 weeks, which is pretty impressive. Lego seems to be getting better about churning these fan models out and it gives me pretty high hopes for future projects. The end result is beautiful and not very far off from the original design, which is a joy. It looks like all they really did was tweak the bases for the models. The birds are a big challenge to build, building something to look organic from Lego bricks is not easy, but it is a great challenge and one I enjoy very much. I like to think of Lego as the best puzzle in the world. Lego already has the 580 piece set listed in their store for $44.99, so excellent value too at just 7.7 cents per element. Unfortunately, we will have to wait just over a month before we can get our hands on one as it will not available for purchase until January of 2015.